Whether aware of it or not, an organization functions because it is made up of parts that are designed to work together in unison to accomplish the overall mission of the organization. These parts (employees, departments, project teams, competencies, processes, products and so on), taken together, form the business architecture of the complex social system which is the organization. The Business Architecture capability, on the other hand, reflects the organization’s intentional efforts to establish a formalized competency supported by dedicated people, processes, procedures, and technology, which expressly serves the purpose of aligning the strategic and operational goals and processes in the organization. It is safe to say, therefore, that every organization has a business architecture, but not necessarily a Business Architecture capability. 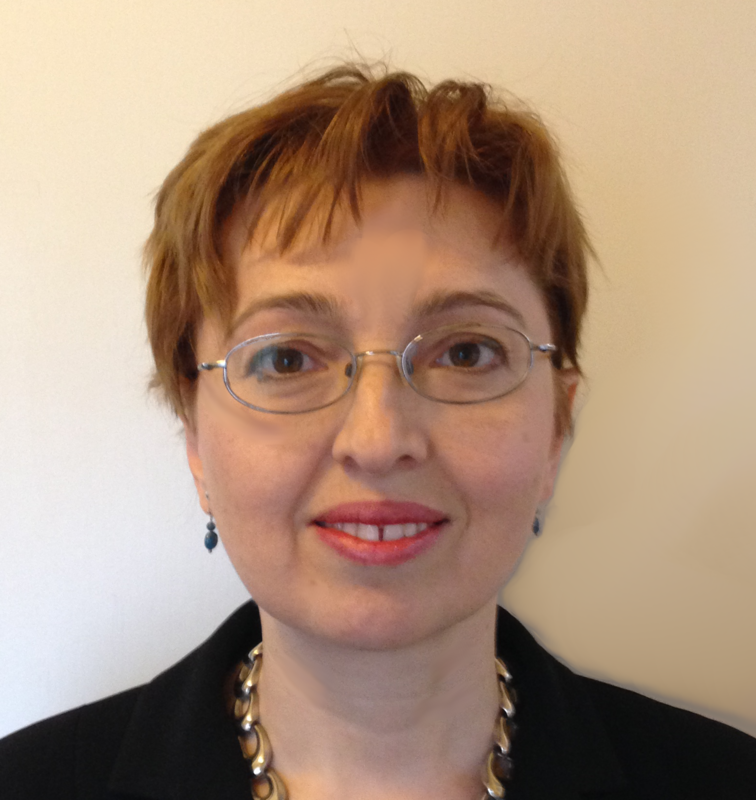 For architects and organizations that have embarked on building a well-defined Business Architecture competency, this article provides practical advice for conducting a Business Architecture capability maturity assessment, together with the key steps for using the maturity assessment findings to define the capability improvement roadmap. We as architects are wired – perhaps more so than practitioners in other professions – to seek order and structure and to discern patterns. Our corporate clients, on the other hand, many of whom may have been steeped into the inner workings of their organization for some time, have other worries. They need to meet deadlines. They need to show progress. They need to make their numbers. That is not to say that our clients do not intellectually understand that strategy and processes and alignment are valuable to the growth of their organization, but the burning question for them is – are they adding value to the organization now? The focus on short-term targets pervades throughout all levels of the organization, and CXOs are not immune to it. On the contrary, they are most acutely aware that their own viability and value as leaders in the company is only as good as the last Annual Report. What we all have in common, nevertheless, is a deep-seated need for predictability. It is this craving for predictability that can give us an immediate common ground with our clients when we start a new engagement. The start of a new consulting engagement is similar to a rite of passage, both for us and for our client. We open up to a new experience and they open up to new ideas. For this reason, one of the best opportunities you have to recommend (and get approval for) a Business Architecture capability maturity assessment is soon after commencing work with a new client. Such an assessment is critical for us as consultants in order to get a baseline on how the client organization’s business strategy gets articulated through the Business Architecture and is further transformed into enablers that support execution processes (if indeed that happens). The client, in turn, gains a clear understanding of how the existing business architecture practices support (or don’t support) the strategy-to-execution continuum and a detailed roadmap for improving the integration of Business Architecture into the enterprise planning and management process. In my practice, I have found the Business Architecture Guild’s Business Architecture Maturity Model™ (BAMM™) to be a useful and intuitive tool to use when assessing the maturity level of a Business Architecture competency in an organization. The BAMM™ is currently the only representative maturity assessment framework specifically designed for the Business Architecture practice. However, I would be remiss to not highlight here that the BAMM™ is a relatively young framework and it is still going through its own maturation life cycle. Business Architects who want to consider a broader palette of choices in their maturity assessment tools can find additional inspiration in several well-seasoned Enterprise Architecture maturity frameworks (such as the U.S. Government Accountability Office’s Enterprise Architecture Management Maturity Framework , the TOGAF® Architecture Capability Framework , the U.S. Office of Management and Budget (OMB) Federal Enterprise Architecture Framework , and even the now-retired OMB Enterprise Architecture Assessment Framework ). This article leverages the BAMM™ as an illustration of a structured, repeatable way to evaluate and assess in quantitative terms how far along an organization is in building a Business Architecture competency. The key concepts in BAMM™ are listed here for reference. 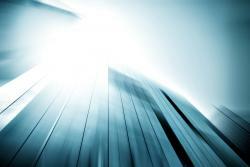 The BAMM™ provides five well-defined maturity levels, which are viewed as evolutionary steps towards reaching a mature Business Architecture discipline in the organization. Each maturity level measures the extent to which a specific group of practices are explicitly defined, managed, measured, controlled, and effective. Level 1 (Initial): At this level, the organization has no Business Architecture competency. While certain business architecture practices may be in place (for example, individual projects may leverage model-driven architecture to facilitate solutioning), such practices are not governed at the enterprise level and are not conceptualized as belonging to a defined discipline. Level 2 (Managed): The Business Architecture competency’s mission and goals are clearly articulated within the organization. Executive sponsorship for Business Architecture has been established, the governance processes and structures are in place, and adequate resources have been allocated to support it. Level 3 (Defined): The core business architecture domains pertinent to the organization have been determined. The Business Architecture group, working with the business, has developed key artifacts including, at the minimum, the capability map, the value stream map, the information map, and the organization map. All business architecture artifacts are captured in a central repository. Level 4 (Strategically Executed): The Business Architecture group is regarded as a strategic partner in identifying business opportunities, driving business innovation, and shaping the business strategy. Business architecture practices are used consistently throughout the organization to identify opportunities for performance improvement, incorporate such opportunities into the project portfolio, and act as a driving factor in business and IT transformation initiatives. Level 5 (Fully Integrated): The business strategy is articulated and realized through business architecture, with support from enterprise architecture and technology strategy. Capability considerations drive investment planning and the selection of programs and projects for portfolio management. The business architecture includes continuous improvement processes to foster innovation and agility. The BAMM™ distinguishes between “foundational categories” of maturity measures, which are mandatory for every organization, and “relational disciplines”, which are categories of measures that apply to the relationship between Business Architecture practices and adjacent practices that may exist in the organization. Governance: The processes and organizational structures created to monitor, review and approve the business architecture development practices and artifacts. Business Strategy Linkage: Business Architecture’s contribution to the development of the business strategy, and to the translation of business strategy into strategic initiatives aligned to the IT roadmap. Management Involvement: Business management’s role in championing the Business Architecture discipline, setting direction and driving the governance and oversight of the business architecture in the organization. Architecture Process, Methods and Practice: The organization’s adoption and usage of the business architecture practices and artifacts recommended by the BizBoK®. Communication: The existence of a communication strategy which drives how Business Architecture’s practices, outputs and benefits are messaged throughout the organization, and which results in business owners seeking out support from the Business Architecture group. Tools & Content: The usage of a mature, integrated end-to-end suite of tools that fully support the Business Architecture practices and methods and facilitate the creation and maintenance of a central repository of high-quality artifacts. People: The existence of a group of professionals in the organization who are dedicated to the practice of Business Architecture and who benefit from discipline-specific training and career advancement track. Business Architecture Mapping: This heading covers a series of nine categories containing measures for evaluating the extent to which graphical maps representing the business strategy, capabilities, organization, organizational value, business information, products and services, policies and, respectively, stakeholders, and the usage of such maps in organizational goal-setting. Discipline Alignment to Business Requirements: The degree to which the business requirements analysis and management practices are aligned to business architecture practices. Business Architecture – Case Management: The degree to which the organization’s use of case management activities (implemented through workflows and business rules) leverage business architecture knowledge and artifacts. Discipline Alignment to Business Process Modeling & Management (BPM): The extent to which the process management framework is integrated with business architecture and with business analysis concepts and artifacts. Discipline Alignment to Lean Six Sigma: The extent to which the business architecture is leveraged to identify opportunities to use Lean Six Sigma for process and performance improvement. Business Performance Management: The extent to which the business architecture is leveraged to establish business performance metrics (including metrics for the performance of the Business Architecture capability itself). Business Architecture and IT Architecture Alignment: The extent to which the organization’s IT investments and its IT roadmap are aligned to the business architecture and enable the organization’s performance goals. The measures provided by BAMM™ for each of these categories and at each of the five levels of maturity form a frame of reference against which the capability maturity assessment can be performed at a fairly fast pace – one to two weeks, in general. The maturity assessment provides an opportunity for the client organization to go through a self-discovery process. Therefore, it is important that our approach and guidance throughout the process fosters inclusion, encourages self-reflection, and ensures the assessment is performed in an objective and non-judgmental manner. I have personally find it productive to start the assessment with an offline documentation review, during which I take stock of relevant policies and procedures, governance charters, meeting notes, and the content of the client’s existing architecture repository. I follow my initial analysis with in-person work-sessions where I reflect back my findings and encourage clients to ask questions and to express their hopes and concerns about how Business Architecture can help solve problems in their organization. These conversations are crucial in fostering a shared view of what is possible in the near-term, given existing organizational constraints, and what could be accomplished in the long term with a mature Business Architecture group. 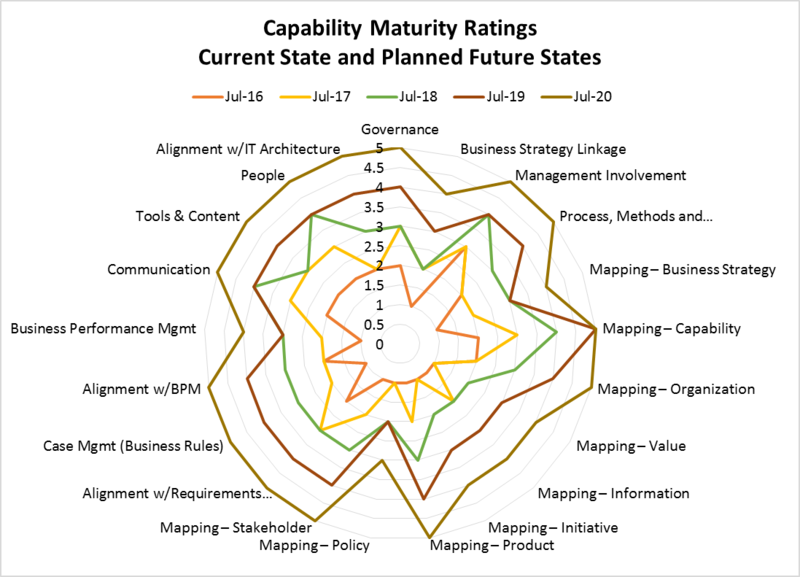 Once the maturity assessment is completed, the quantified results showing the current-state maturity level of the organization’s Business Architecture capability are plotted in a graphical format. These results form the baseline for devising a realistic roadmap for strengthening and growing the effectiveness of the Business Architecture capability over the following 2 – 5 years. The specific capability improvement activities for the planning period are then identified through a six-step process, as follows (see Figure 1). The results of the assessment process and of the subsequent evaluation of future desired maturity levels are best rendered visually, to facilitate the absorption of information and provide clients with a summary “snapshot” of the assessment scores. Spider-diagrams, for example (see Figure 2), can be used to capture the current-state readings and lay out the future course for the Business Architecture capability through time-based, incremental improvements. 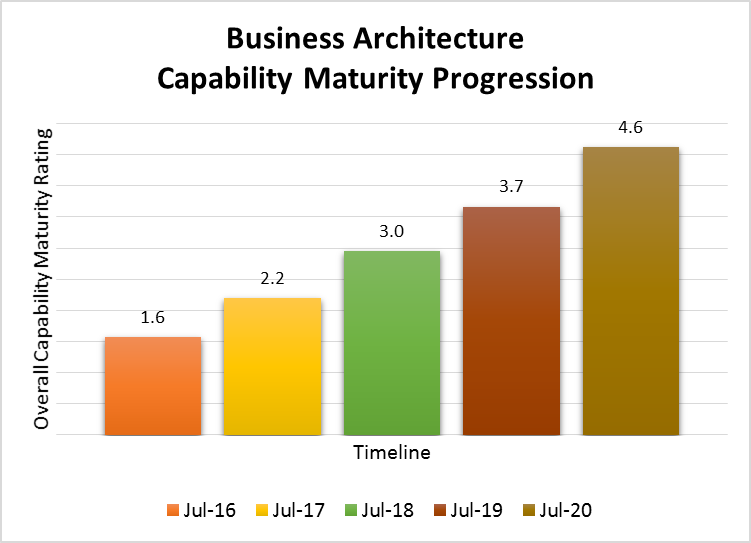 As a quick reality-check, a bar chart showing the evolution of the capability maturity average scores over the planning period (see Figure 3) can also be leveraged to pinpoint potential discontinuities in the planned evolution of the Business Architecture practice in the organization. Conducting a comprehensive and effective capability maturity assessment requires clear and open communications, an objective and pragmatic approach, and the use of a well-defined and repeatable assessment mechanism. The results of the assessment should be shared in an easy-to-follow report that facilitates participation and invites the clients to become co-creators of the capability roadmap. This report embodies the organization’s commitment to embrace Business Architecture as the main platform for discussing business goals, challenges and solutions. Therefore, refer to it often and use it wisely.